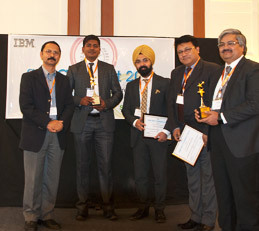 At an IBM supplier event last week Experis IT team was awarded the IBM innovation award for 2015! Despite the workforce demand the team had to work in volatile workforce planning conditions with pressure to find talent at low market rates. Last year they put forward an innovative Hire Train Deploy model to address the gap. In collaboration with Manipal University the team has created a graduate hire program which trains up freshers to the appropriate level required for IBM. In the past few months the team put around 400 through training with conversion rates to date at IBM of over 90%. The team looks forward to continue this velocity through 2016!